If your pup is high-strung, jumpy, nippy, chewy, or seems to bark a lot, you may want to think about ways you can help relax your dog, make him feel more secure, and help him relieve stress. Perhaps you have a dog that is listless, submissive, or easily spooked. You may be worried about your dog’s anxiety and stress levels. For both types of dogs, there are ways to get your dog more relaxed and centered. We’ll discuss three strategies in this blog. No one likes to hear that their dog is not getting enough exercise, but the most common reasons dogs misbehave or act out is due to lack of exercise. Regular exercise and outdoor activity can also reduce or eliminate boredom and shy or submissive behavior. After all, most dogs were bred to run, jump, hunt, retrieve, pull, dig, guard, or otherwise perform some type of physical activity. Without enough exercise, your dog may begin engaging in unusual or destructive behavior. The lack of exercise can affect dogs in a variety of ways, from aggression to submission, and everything in between. 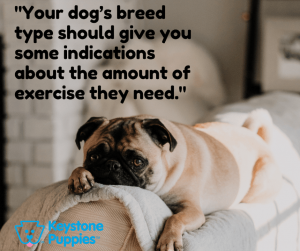 Your dog’s breed type should give you some indications about the amount of exercise they need. For example, if you have a working dog, a herding breed, a snow dog, a guard dog, or a hunting breed, your dog needs lots of outdoor exercise every day. If you have a small lap dog, short outings are usually sufficient. It’s important to remember that even small, low-exercise dogs do better with daily walks and time outdoors every day. And it’s not enough to let them out in a yard unsupervised. Dogs need companionship and stimulation to keep them running and playing. Every day you must spend with them; in the yard, playing fetch, on walks or runs, or taking them to a dog park where they can run and play freely. Playing and exercising with your dog also has real physical and psychological benefits for humans, so don’t deprive yourself and your dog of this valuable time together. All kinds of dogs like to stay busy. Make a point to take them along in car rides when weather permits (but don’t leave them in the car for more than a few moments.) Bring them to the park, to the beach, and on hikes. Swimming is also a great physical activity for some breeds. If you simply can’t manage that level of activity, consider hiring a dog walker or taking your dog to a doggy daycare with large play areas, that allow long periods of interaction with other dogs. It’s also helpful to spend lots of time with your dog outside, even if you can’t interact with your dog continuously during these outings. Side by side companionship is also enjoyable and satisfying for your pup. Let your dog sniff around the yard while you read a book outside. Answer emails while you and your dog hang out on a park bench. Bring your dog with you to get the mail or pick up dry-cleaning. 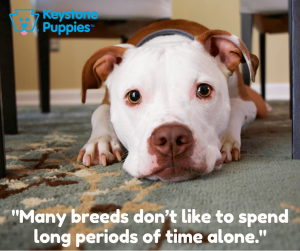 Many breeds don’t like to spend long periods of time alone, and few dogs do well if you’re going for long hours every day. However, some breeds are more independent than others. Research your breed and find out how much attention and human companionship they need to stay happy. 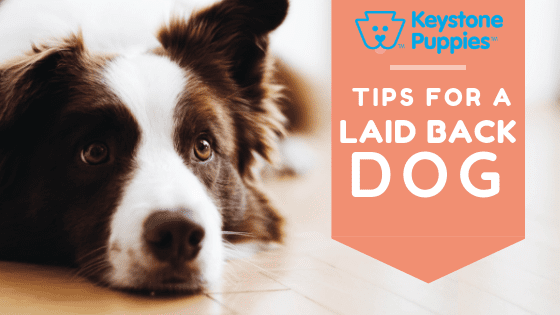 If you find you regularly have to leave your dog alone for extended periods, it may be time to find a dog sitter, a dog walker, or a doggy daycare to help keep your dog entertained and exercised while you’re gone. Check out our blog on dog sitting to get tips on selecting the right dog caregiver for you. If you work all day, make sure you spend your free time with your pup at home. He needs companionship every day to feel secure and centered. Evaluating exercise, activity, and time you spend with your dog is the first step to curing behavioral issues. But if you still have a dog that is acting out, destroying your property, exhibiting aggressive behaviors, barking incessantly, marking or urinating indoors, is listless or unusually submissive, or is easily frightened by people or noises, you may want to call in the experts. First, make an appointment with your vet to discuss your dog’s issues. Work with your vet to eliminate the possibility of medical issues. For example, indoor urination may be due to a urinary tract issue. Listless or submissive behavior may be a sign of illness. If your dog’s behavior is limited to one or two circumstances (he panics at the sound of fireworks or thunder, for example) your vet may be able to help you with a plan of action that will help your dog relax during these unusual circumstances. If your canine pal is healthy, and his behaviors are not limited to one or two specific circumstances, you may want to find a good dog trainer to help you identify and correct undesirable behaviors. A talented dog trainer can help you calm an aggressive dog and help develop confidences in a submissive pup. The American Kennel Club offers great advice for finding and evaluating dog trainers. Keystone Puppies cares about the well-being of all dogs. Make sure you provide your dog with the exercise and companionship he needs to stay healthy and centered. If your dog is exhibiting unusual behavior problems, talk to your vet. If your animal is healthy, work with an experienced trainer to find the best way to address behavioral issues. If you’re not sure which breed of dog is right for you, start by researching over 200 breeds here. If you know which kind of dog you want, click here to start looking for the pup that is right for you. Don’t Let Winter Get Your Dog Down!